Ideally situated in the Grand-Duchy of Luxembourg, at one of the crossroads of Europe, the company imports fresh products from the four corners of Europe and all over the world and distributes them throughout the Greater Region. Marcel Grosbusch & Fils has been importing and distributing fruit and vegetables for nearly 100 years. Marcel Grosbusch & Fils has been involved in importing and distributing fruit and vegetables since 1917 and has become a leader in the Grand-Duchy of Luxembourg and throughout the Greater Region. By focusing on quality and customer service, the family company has developed gradually, combining tradition with innovation. Grosbusch works with the greatest respect for products and growers, and has built up strong relationships with the latter. 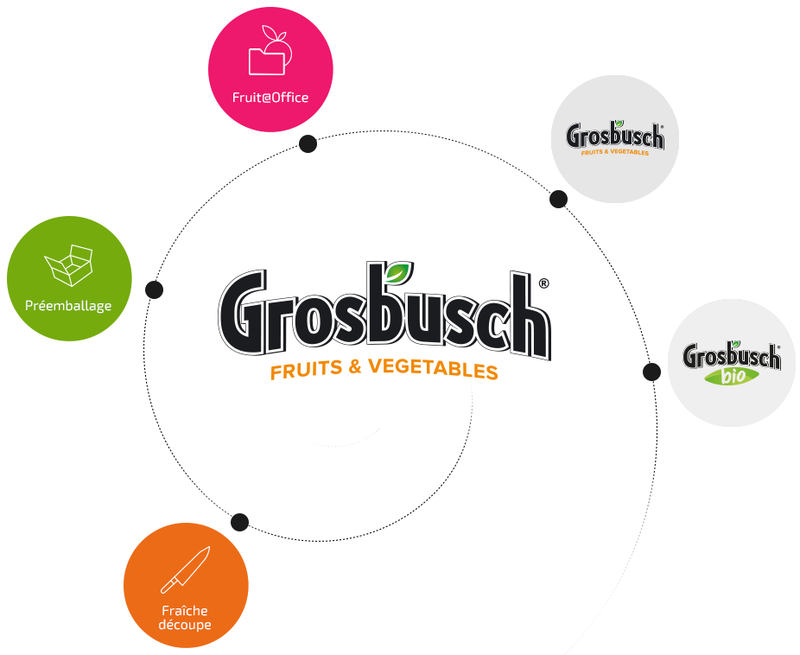 By being uncompromising on quality and ensuring that its fruit and vegetables are absolutely fresh, Grosbusch guarantees that its customers always receive products that are always healthy and tasty. The company works with supermarkets and hypermarkets, local authorities, caterers, restaurants and sectors of the food industry, such as bakers, butchers and grocers. We seek to build up lasting partnerships with them by offering a high-quality range of fruit and vegetables. The quality offered by Grosbusch is guaranteed by the professionalism of its employees, efficient facilities, constant rigour and a detailed knowledge of our partners’ products and expectations. A number of certifications confirm the company’s commitment to a policy of continually improving quality and services for the benefit of the customer. While the fourth generation has continued to consolidate on what has been done in the past, the company has not hesitated to take up new challenges. In the last few years, by developing new services and quality brands, Grosbusch has positioned itself as a pioneer, using innovation to meet everyone’s expectations and adapt to new consumer trends. Jean-Pierre Grosbusch founded the Grosbusch company in Differdange to import fruit and vegetables. Marcel Grosbusch launched into the wholesale fruit and vegetable trade. The company continued to grow. Its success meant that it had to move, first to Soleuvre then to Leudelange. The Grosbusch grandsons, André and René, were the 3rd generation to take up the torch. The firm of Marcel Grosbusch & Fils moved to La Cloche d’Or. A new logistics hub was built for fruit and vegetable distribution and packaging in Ellange, at the heart of Europe. René Grosbusch’s children, Lynn and Goy (4th generation), joined the firm. Enlargement of the Ellange site to cover a total area of 12,500 m2, to incorporate all the firm’s activities on the same site.